Solegra LED blends perfectly into any interior thanks to various construction sizes and mounting methods. The lighting technology and optic can be custom-adapted to the specific room utilisation – e.g. the version with micro-prismatic optic for the glare-free lighting of VDU workstations. The Solegra LED offers additional individual design options in the version with a closed, light-impermeable edge. The powder-coated aluminium ring accessory for this is available in the colours black, white and silver-grey by default. By its presence in the room alone, Solegra LED upgrades the atmosphere and creates a homely feel. Thanks to its purist design, the luminaire blends discreetly into the background and harmonises with almost any architectural surroundings thanks to four different construction sizes with diameters of 400 to 1200 mm. The luminaire can also be flexibly mounted in the room and thanks to its round, minimalist design has a very stylish appearance. Due to the different luminous flux packages, all sizes appear to be equally bright. As such, even swarm placements of the Solegra LED in different sizes are possible with a uniform light effect. Solegra LED is not only light management-capable but also has an Active version that optionally enables the lighting to be oriented to the natural course of the day. This light is capable of supporting the individual biological rhythm and offers maximum visual comfort for highly different work tasks, matched to the individual needs of the workers. Because of its many variants, Solegra LED can be used to illuminate highly different areas of a building with a uniform design. The design fits perfectly with modern office structures featuring open space areas and communication zones. 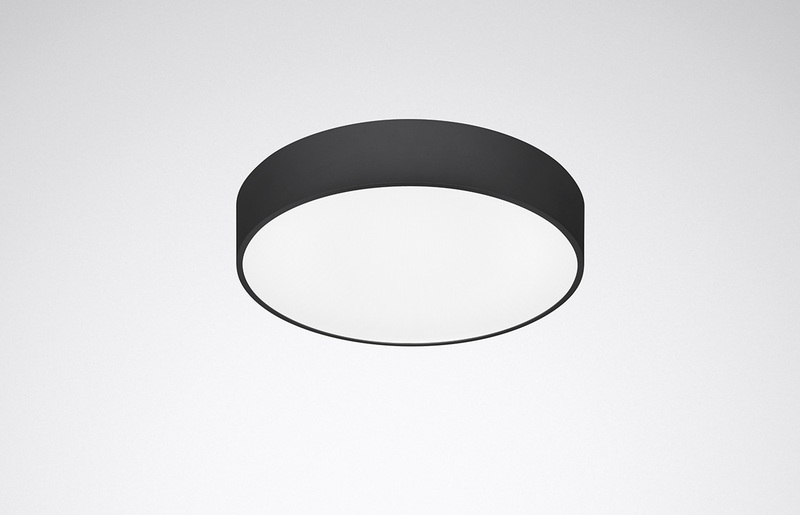 The optional aluminium ring of the Solegra LED is available in the colours black, white and silver-grey as well as, upon request, in other RAL tones. It blends harmoniously into the existing interior design. In combination with an insertable CDP cover, variants with UGR<19 can be implemented in a breeze. These provide for the right light at VDU workspace and can also be utilised in auditoriums or classrooms. 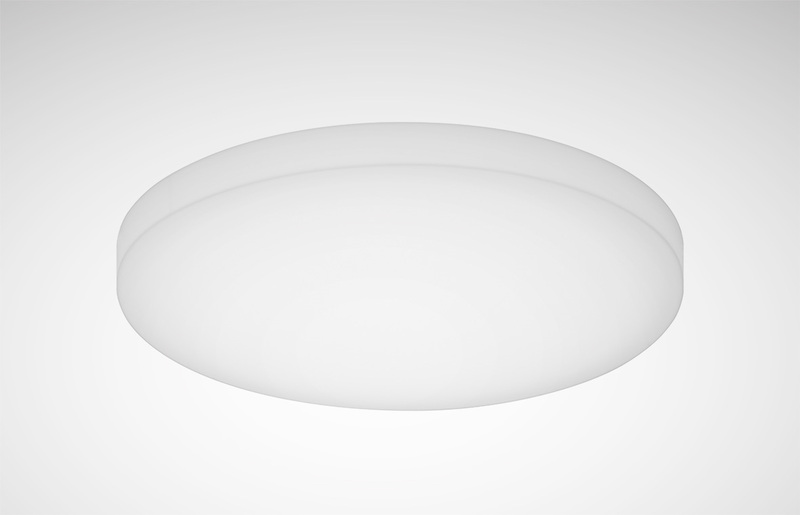 The basic version with opal diffuser is perfectly suitable for the illumination of entrance areas or foyers as well as in the Shop & Retail sector. Installation work above the head is often tiring in the long run. Solegra LED offers a clever solution for this: in the first step the mounting body is attached to the wall or ceiling and the luminaire body is fixed with a steel wire which prevents it from falling. The wire bears the weight during wiring – it couldn't be more convenient. 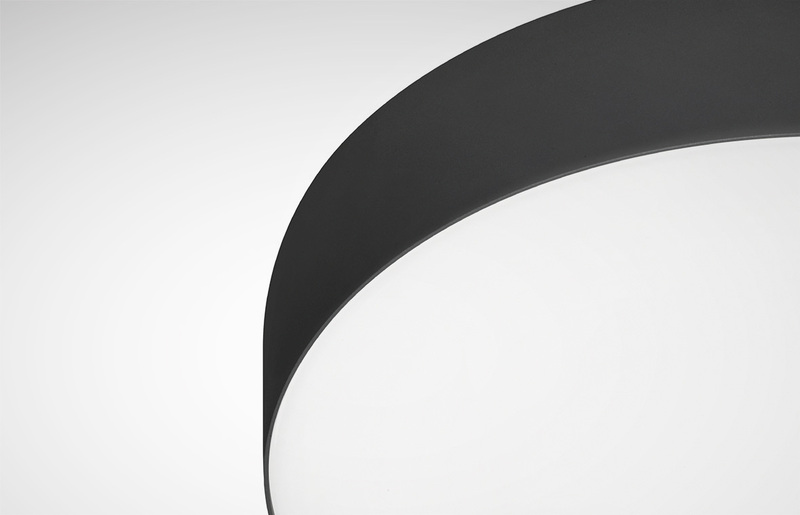 The luminaire body is then rotated via a rotating mechanism into the mounting plate until it clicks in. A locking screw provides for additional support. Solegra LED is installed optionally as a wall, ceiling or suspended luminaire. For suspended luminaire installation, two different pendant accessories can be selected: in addition to a version with three parallel wires and a ceiling rose, Solegra LED is also available with three conically tapering steel wires that come together in an installation-friendly ceiling plate. Thanks to its circular shape, Solegra LED can also be positioned decentrally in the room without disrupting the harmony, e.g. in creative zones. Installation needs no complex lighting design because the round luminaire can be flexibly mounted in the room while featuring the same quality of light. Solegra LED shows its flexible side in terms of colour. The opaque-coated, translucent frame is available in the standard colours black, white and silver and also on request in other RAL colours. Light emitted by Solegra LED is high-quality, uniform and without glare. 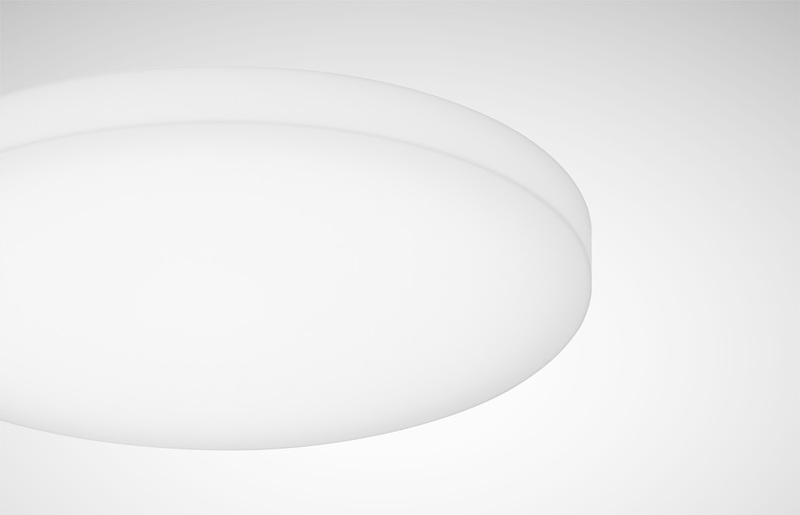 A special room impact can be achieved thanks to the large, round light surface. The Active version of Solegra LED is able to simulate the daytime sequence among other factors. Individual control of various lighting parameters such as light intensity and light colour means that the well-being and ability to concentrate can be positively influenced. This applies particularly to planar luminaires such as Solegra LED because the light from such luminaires reaches the eye via a wider surface. With its simple, cylindrical shape, Solegra LED blends harmoniously and flexibly into any interior. The large round luminaire and pleasant light give the room a special style and homely ambience. This increases the attraction of the workplace. Fit for New Work and Co. The combination of purist design and innovative technology means the luminaire is ideal for modern offices having high demands on quality of light and room atmosphere. It blends into minimalist room concepts with clear structures or else sets specific contrasts in open space areas, for example with industrial design styles. The light management-capable Active luminaire also enables flexible utilisation of the room by custom-adapting the light to the specific work situation. Typical further applications where the luminaire scores points via perfect light and its prestigious, modern design are auditoriums, open workplaces, communication zones, corridors, foyers and sales spaces. Illumination effect: completely harmonious illumination effect due to uniform light emission, primarily direct light distribution, high level of lighting comfort due to decorative brightening of the ceiling. A refined atmosphere instead of a discounter look: the Solegra LED series of round luminaires upgrades sale spaces with its round, modern design – and achieves tailor-made light everywhere for ideal visual conditions. The result is high quality, individual lighting concepts for shop & retail. 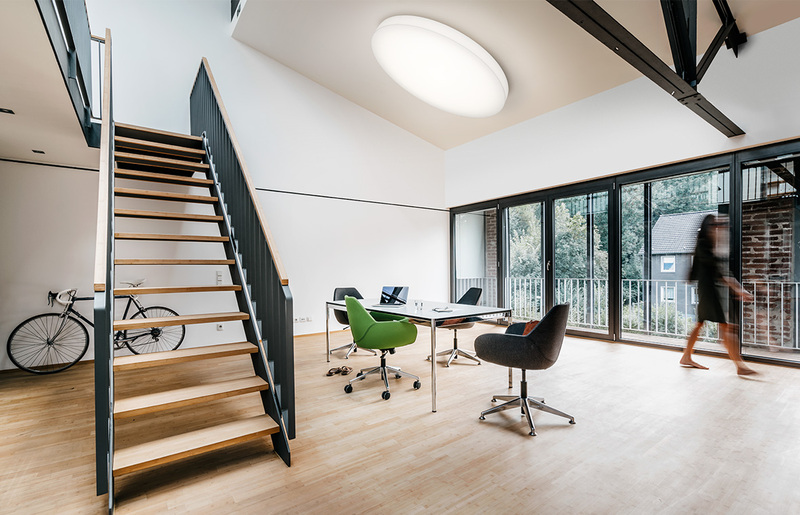 Ideal for new worlds of work: The flexible Solegra LED range of round luminaires upgrades rooms with its modern design and achieves ideal visual conditions anywhere, ranging from VDU workstations to creative zones. The luminaire is controllable via the LiveLink light management system on request. Modern training concepts put an emphasis on a motivating atmosphere for communicating knowledge. The Solegra LED range of round luminaires upgrades entrance areas, transition areas, classrooms and auditoriums with its attractive design – and achieves perfect visual conditions thanks to glare-free light, also for work at computer screens.